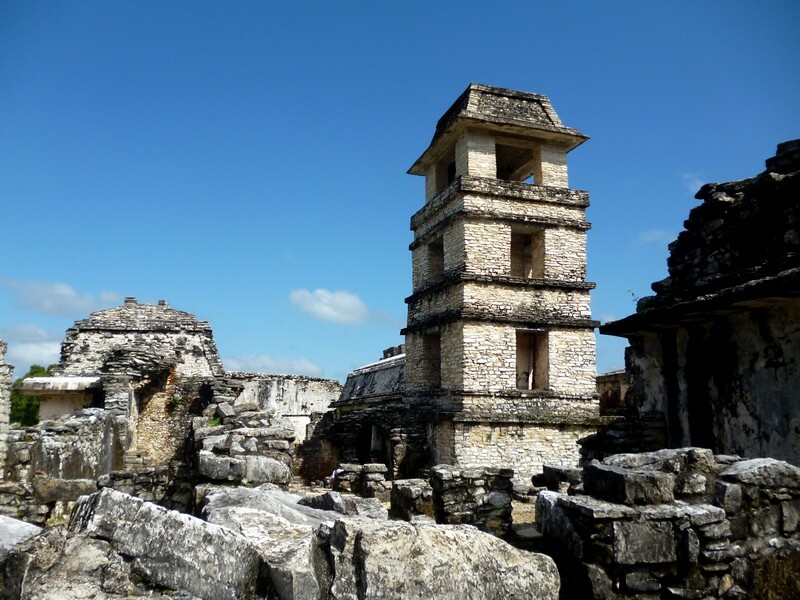 Palenque – better than Tikal? The site is much smaller than Tikal, but mainly because they have only uncovered around 5%, with the rest remaining below ground. And so from Flores it was on towards Mexico, the final country on our trip and our last overland border crossing. And what a border crossing it was! After being picked up by a minivan at 5am, we finally set off around 6am after much stopping and starting and waiting, I’m not sure what for. After an incredibly bumpy journey along some of the worst roads in Central America, the like of which we’ve not experienced since Bolivia, we arrived at the Guatemalan exit post out in the middle of nowhere. Here we got our stamps for the small price of 40 pesos, not an entirely legitimate fee but not a lot you can do about it. One couple tried refusing but simply got told that if they didn’t pay they wouldn’t get a stamp so after they’d eventually coughed up (come on guys it’s only £2) we were on our way again. A few miles down the road and we were all hauled off the bus and onto a boat to ride down the river and into Mexico. After half an hour on sewage infested waters we were out the other side onto dry land once again for our Mexican entry stamps. Then it was a short ride in a taxi to the bus stop before we piled into another minibus for the last leg of our journey to Palenque. Nearly nine hours after setting off we finally arrived at our destination. Phew. We were only staying in Palenque for a couple of days. There’s not a lot to see or do here except the ruins but we’d heard they were as good as Tikal or Copan and better than Chichen Itza. The town itself is pretty non-descript. Lots of shoe shops. Not much else of note. Still, our room was cheap and there was a Burger King in town so we had nothing to complain about. After dinner it was an early night, the journey from Flores had taken it out of us. The next day and we were off to the ruins. After our disappointing tour of Tikal, we decided to go it alone again this time and off we went, armed with our Lonely Planet for information. Collectivos head out to the ruins every 15 minutes or so and it takes about 20 minutes to get there. You have to pay an entrance fee when you reach the National Park and then get another entrance ticket to the ruins itself, all in about 100 pesos in total (£5). The site is much smaller than Tikal, but mainly because they have only uncovered around 5%, with the rest remaining below ground. When you consider what the whole place would have been like at the time it’s pretty impressive. The structures are also more complete than Tikal. Ok, they’ve done some restoration in places and you can see where, but it really helps give you a sense of how it would have looked. The setting, deep in the jungle, is beautiful too, although the dozens of hawkers selling tourist tat do somewhat detract from the serenity of it all. The other great thing about Palenque is that you can still climb up most of the structures. I’ve heard that Chichen Itza is all roped off these days so you can’t really explore properly ( someone died ). The stairs are steep though so wear proper shoes and comfortable clothing, the Eastern European girl in a dress struggled a bit and we got a great view of her knickers a few times. It’s definitely worth the climb though as you get some awesome views over the whole site from the buildings that sit up on the hill. Since the ruins are in the jungle there are also a couple of waterfalls on the walk back to civilisation. Not quite the spectacle of Iguazu but pretty nonetheless. After a few hours at the ruins it was back to town for something to eat before heading to the bus station for a overnight journey to Merida. Then a few days there to celebrate Rich’s birthday before a final few weeks on the coast.